The new pplelectric.com home page. 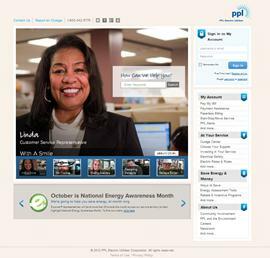 PPL Electric Utilities has unveiled a redesigned website, an improved cyber-destination molded through customer input and a commitment to make it easier than ever to manage electric use and costs. The new site lives at the same trusted web address — pplelectric.com. Customers still can use the great website features they’ve always used, but the makeover is aimed at making the site more functional and user-friendly. An improved smart search function. A new sign-in area and sign-in ability from any page on the site. Simplified but more comprehensive navigation. Most information customers want is just a click away. Latest news from PPL Electric Utilities so customers can stay up to date on new energy efficiency programs, reliability improvements, community outreach activities and more. Account summary information all on one easy-to-read page. Easy-fill online forms to make self-service transactions simpler. An integrated Twitter feed for the latest utility and storm information. “PPL Electric Utilities is a customer service leader and the website is one reflection of that,” Walker said. “For customers who haven’t used our website to do business with us, there’s no time like now to start.